Rediff.com » Business » Who gained how much from the high petrol price? Low oil prices drove the growth in states’ share faster than expected, says Abhishek Waghmare. 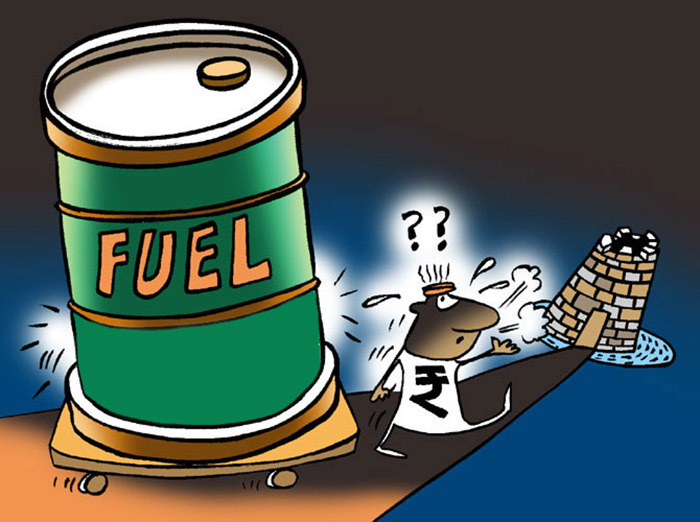 The fall in crude oil prices in the past three years -- induced partly by a demand shock and a supply glut -- has given a fiscal bonanza to the Union government, the benefits of which have not been entirely transferred to retail consumers in the country. While the crude oil price from May 2014 to January 2016 fell 74 per cent, retail petrol and diesel prices fell only 17 per cent and 22 per cent, respectively, in this period. And, while oil prices have risen 84 per cent from January 2016 to September 2017, retail petrol and diesel prices in the same period increased by a relatively modest 11 per cent and 24 per cent, respectively. Here is an attempt at analysing the three distinct aspects surrounding the oil economy: Fiscal impact on central and state finances, and the consumption patterns of petrol and diesel in India. The objective is to find who gained how much in a larger time frame, and who consumed how much for what. Owing to high and rising oil prices in the 2000s, diesel, kerosene, and domestic cooking gas or liquefied petroleum gas (LPG) were heavily subsidised. The subsidy outgo was far more then than the income through taxes on petroleum products. As crude oil prices (for Indian consumption basket) rose above $100 per barrel in February 2011, FY12, FY13 and FY14 witnessed a sustained period of very high crude prices. As a result, prices in the domestic market started touching new highs, and as a safety net, the government capped diesel prices, subsidised LPG cylinders, and paid the under-recovery to the oil marketing companies (OMCs). Even though it continued collecting taxes on petro products, the exorbitant subsidy bill effectively made the government spend Rs 64,000 crore (Rs 640 billion) on petroleum products in FY13. From this nadir, the central government achieved a fiscal gain of Rs 2.5 lakh crore in 2016-17 -- a turnaround of Rs 3.1 lakh crore in five financial years -- led by a drastic drop in crude oil prices, increase in excise duties, and deregulation of diesel. Profits of government-owned public sector OMCs -- IOCL, HPCL and BPCL -- quadrupled during this period, debt situation improved and the dividend paid out to the central government, too, doubled. Among the PSUs, profits of HPCL soared sevenfold. States received an increased share from the central pool of taxes, courtesy the Fourteenth Finance Commission. Low oil prices drove the growth in states’ share faster than expected, since states earned revenue from the sales tax, or the value-added tax (VAT), levied on petroleum products consumed inside the state. Maharashtra, Uttar Pradesh, Tamil Nadu, Karnataka, and Gujarat account for more than half of the petrol and diesel consumption in India, and thus have been considered for the analysis. The increase in VAT on petro products is a substantial part of the increase in total state VAT from FY16 to FY17. Maharashtra and UP managed to reduce the gross fiscal deficit, too, thought the impact of oil on Maharashtra’s fiscal health seems to be stronger than that on UP’s. Consumption patterns of petrol and diesel across states, and across end-uses reveal which economic sectors in which states would have benefitted, had the entire 74 per cent fall in crude oil prices been transferred to consumers. Though Maharashtra consumed the highest volume of petro products in 2016-17 -- about 4.1 billion litres of petrol and 11 billion litres diesel -- consumers in Haryana, Punjab and southern states utilise more fuel per person. Haryana tops per head consumption in both fuels: Petrol at 47 litres and diesel at 265 litres, respectively. However, Maharashtra has the narrowest ratio between diesel and petrol consumption, which can be construed as a metric that represents balance between personal use (petrol-fired vehicles) and business/public use (diesel-fired trucks, pumps). Agriculturally-rich states Haryana and Punjab still spend more than a fifth of their diesel consumption on farming and allied activities, mainly pumps and tractors. Industrial states such as Maharashtra, Gujarat and Tamil Nadu spend less proportion of diesel on agriculture and industry than other major states, meaning the shift to better sources of electricity has been achieved.